past studies have shown air pollution affects crop yields. Now a link has emerged between air pollution and plant pathogens. Bart A Fraaije, a plant pathologist at the Rothamsted Research in Harpenden, uk and his colleagues examined data spanning some 160 years and found that industrial emissions directly affect which of the two fungal microbes -- Mycosphaerella graminicola (leaf blotch) and Phaeosphaeria nodorum (glume blotch) -- attack the wheat crop. The study was published in the Proceedings of the National Academy of Sc iences (Vol 102, No 15). The two pathogens cause losses of millions of tonnes of grain worldwide, especially in the us and Europe. Frequently coexisting on leaves, these pests damage the wheat crop by decreasing the photosynthetic areas in leaves on the upper part of the plant where the grains form. The microbes, however, do not affect Indian varieties of wheat. Over the past century, European farmers observed prevalence of P nodorum became more than that of M graminicola, which was once dominant. Baffled scientists turned to archived wheat samples from the Broadbalk winter wheat experiment, which started in 1843 and is still running on a series of plots in the uk . Fraaije and his colleagues used polymerase chain reaction (pcr) -- a technique to rapidly replicate fragments of deoxyribonucleic acid (dna) -- to conduct the study. 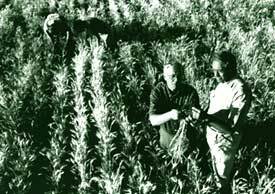 Changes in the dna of the plant samples showed M graminicola, the most abundant wheat pathogen since the 1980s, was also abundant in the mid-19th century while P nodorum was more abundant for much of the 20th century, being at its peak during 1970. The team also looked at the levels of sulphur dioxide (so2), an air pollutant emitted by industries such as coal-fired power stations. It was found that in 1844, when so2 emissions in Britain were about 1 million tonnes per year, M graminicola was three times as common as P nodorum. In 1970, when so2 emissions rose to 6 million tonnes, M graminicola virtually disappeared while P nodorum exploded to 100 times its 1844 amount.